First it was those wily Italian Ferrari forgers, now the masters of intellectual property reuse seem to be getting into the game of copying the prancing pony boys. 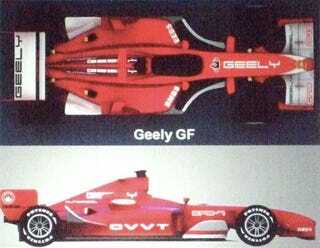 By the looks of this illustration, Chinese automaker Geely seems to be flattering Maranello's F1 squad by way of imitation. We're not exactly sure just how official this is, but the mere possibility of Geely building such a car has our heads spinning. Do they really intend on competing in Formula One? Would the car be constructed from carbon-fiber or fiberglass? Would it have a high-revving V8 or a loosely-assembled pig-iron four-banger? Will the paint be lead-based? If we flip it over, will it have one of those golden stickers on its underside?